Offer will work both on the website and mobile app. This offer is valid only for one booking per user. You can book 2 separate bookings with different accounts if multiple people are traveling together. Get Up to Rs 1,000 instant discount on domestic flight bookings. Minimum ticket value should be Rs 4000. Get flat Rs 500 off on minimum booking of Rs 4000 to Rs 8000. Get Flat Rs 1000 off on minimum booking of Rs 8000 and above. Offer valid on HDFC Bank Credit Cards and EMI only. Get flat 25% off on domestic hotel booking. Minimum booking value should be Rs 3000. Maximum discount will be Rs 10000. This offer is not valid on same day & next day check-ins. Hi! applied it, thank you. Thanks for the feedback sir, please refer your friends and make GrabOn a better place for Users. Thank you! It actually worked received by cash back. Thanks for visiting at GrabOn, we are Happy to help, Please let us know if any concern regarding offer to make GrabOn a better place for user. UDAN (Ude Desh ka Aam Naagrik) is a regional airport development and Regional Connectivity Scheme of Government of India. Get Up to Rs 1000 Instant Discount on booking of eligible UDAN sectors. Minimum transaction value is not required. Offer valid for ONE domestic flight booking per user. Offer valid on select domestic destinations. Get 15% up to Rs 1,500 instant discount on domestic flight booking. Offer is also valid on Bank of Baroda’s Credit Card bookings. The offer is valid for 1 booking per card during the entire offer period. Apply the given discount coupon at the checkout page to avail the offer. This Offer is valid only for 5 tickets. Includes one-way bookings for 4 or more passengers & return tickets for 2 or more passengers. One-way journey- Up to Rs 1800 OFF for 5 or more passengers. Return journeys - Up to Rs 2500 OFF for 5 or more travelers. Avail No Cost EMI and up to Rs 1500 Instant Discount on domestic flight bookings. Minimum booking value should be RS 6000. Get up to Rs1500 Instant Discount for MMT new users and get up to Rs 1200 discount for MMT existing users. The offer is valid from 19th April to 3rd May. Only 1 booking per person during offer period. Get Up to Rs 5,000 instant discount on international flight booking. Minimum booking value should be Rs 25000. Fly to Europe & England on British Airways! Flat Rs 3000 off per passenger on British Airways Flights! Get flat Rs 1500 cashback on international flight bookings. Minimum booking value should be Rs 40000. Now Malaysian Airline flying directly to Kuala Lumpur from Kochi. Fares starting Rs. 9,999/- only! Offer is Valid on Makemytrip Website and Mobile Apps. Maximum Discount of Rs 10000 on Domestic Hotels. Valid only for select hotels. Discount applicable on the base price. Get Up to Rs 1,800 instant discount on domestic hotel bookings. Minimum booking amount should be Rs 3000. Use HDFCDOM1 coupon and get Rs 900 off on Booking of Rs 3000 to 5000. Use HDFCDOM2 coupon and get Rs 1350 off on Booking of Rs 4501 to 6000. Use HDFCDOM3 coupon and get Rs 1800 off on Bookings above Rs 6000. Offer valid for the transactions through HDFC Bank Credit Cards and EMI only. Get 18% up to Rs 10000 discount on Domestic Hotel Bookings. SBI Credit and Debit cards users only. Offer valid on select hotels. This offer is not valid for today's and tomorrow's check-ins. Apply the given discount code at the checkout to avail the discount. Not valid for today's and tomorrow's check-ins. Not valid on Chain Hotels - Taj, Trident, Oberoi, The Leela, Lalit Group, Hyatt, Hilton, ITC, Accor Hotels, Formule 1, Marriott, Sterling, Starwood, IHG, Fortune, The Park, Carlson, Mango. Get Flat 35% instant discount up to Rs 10,000 on domestic hotel bookings. Minimum booking value should be Rs 2000. Instant discount on Domestic Hotels is calculated on the base price (price excluding taxes). Get Up to Rs 5,000 instant discount on International Hotels. Use HDFCINT1 coupon and get flat Rs 1500 off on minimum booking of Rs 10,000 – 20,000. Use HDFCINT2 coupon and get flat Rs 3000 off on minimum booking of Rs 20,001 – 30,000. Use HDFCINT1 coupon and get flat Rs 5000 off on minimum booking of Rs 30,000 and above. Offer exclusively for 1st time new user. Valid for both domestic & international hotels only. At least two nights booking required to avail of this offer. Get Flat 40% instant discount up to Rs 10,000 on domestic hotel booking. Offer valid by the transactions through Federal Bank Debit Cards and Net Banking. Get up to Rs 1300 discount on Domestic Flights & Hotels and International Flights & Hotels. Minimum order value should be Rs 2000. This offer would work for bookings made on MakeMyTrip website only. The Offer is is for 1 booking per email id during the entire offer period. Apply MakeMyTrip coupon at the checkout page to make the savings. MakeMyTrip is providing amazing discounts for Mobikwik new users. Book now and Get Flat Rs 300 SuperCash on a minimum spend of Rs 500. Offer is valid once for only new MobiKwik users. Offer is valid till this month-end. Apply the given MakeMyTrip offers code at the checkout to avail the offer. Select 'Amazon Pay' as payment option in the wallets option while making the payment for your flights. Payment mode can be used for both one-way or return domestic flight bookings. You can pay 10% of the bus fare (up to Rs.40) using your MakeMyTrip Wallet (MyWallet). Minimum booking amount might not be required for this deal. Minimum booking value should be Rs 300. Minimum booking value is not required to get this offer. Valid on selected International Hotels only. Valid for bookings made on MakeMyTrip's website, Android & IOS App site only. Get 15% up to Rs 1,000 instant discount on domestic flight booking. Get up to Rs 200 discount on bus ticket bookings. Offer is applicable on Lakshmi Vilas Bank Debit Cards and Net banking. Apply the given coupon code at the checkout page to avail the offer. Minimum booking value should be Rs 1500 to avail the cashback. The offer is valid only once during the offer period (first-time user). Maximum cashback amount per transaction will be Rs 250. MakeMyTrip is offering exclusive discounts for MMTBLACK users. Offer applicable on minimum 2 nights of booking. Discount valid on first International Hotel booking. The maximum discount that can be availed through this offer is Rs15000. Higher discount for new users. Apply the given coupon code while booking at the checkout page to avail the offer. multiple travel dates available for April to June. Ahmedabad flights will have a technical halt at Bagdogra –one way ( no need to change the aircraft). Date change penalty: Rs 3000 ( subject to availability of seats). Name change allowed till 15 days prior to departure. Name change penalty: Rs 3000. Flight departures from Delhi, Kolkata, Ahmedabad, Mumbai. Get up to Rs 7500 off on flights to Thailand. Discount on the base price (price excluding taxes). Pay 7% of the Base price up to max. Rs.4,000 using MakeMyTrip Wallet. No Upper Limit on Discount. Applicable for a booking of minimum 2 nights. Valid for all bank transactions. How to save on hotel booking cancellations? Valid on cancellations up to 48 hours before check-in. Flexible pick up and drop. Offer valid only on APP. Offer applicable on roundtrip outstation cabs. get An instant discount of 25% on booking select online Holiday packages. Free airport transfers up to Rs 1,200 on card load. Verified on 20 Apr 2019. Rebate on domestic hotel bookings. Helicopter Airport Transfers offer for Bengaluru. HeliTaxi could be booked from the Trips section. Introducing myBiz by MakeMyTrip to Save more on business travel. GST - Claim up to 18% as credit on all your flights & hotel bookings. Sign Up here to avail the offer. While there is no shortage of websites providing latest & hottest coupon codes for MakeMyTrip, GrabOn offers verified and validated coupons. All the discounts and deals listed are hand-picked and curated very carefully before uploading them on the platform. The category and payment filters (by banks and mobile wallets) also make it easier for you to find the right deal. Enjoy up to 50% off on hotel bookings in Dubai. Exciting and big discounts of up to 50% off on domestic hotel bookings. Get Rs 250 off in the form of SBI bank offers on domestic flight bookings. Cashback worth Rs. 15000 on international flights and save up to 50% off on hotel bookings using HDFC card offers. MakeMyTrip Review - Why Should You Choose MakeMyTrip For Flight Booking? MakeMyTrip is one of the most popular online travel company in India. It has become a household name for booking international flights or domestic flights. Not only airline tickets, but MakeMyTrip also provides train, bus and hotel booking opportunities. Their full-fledged platform provides cheap tickets, amazing deals, and affordable holiday packages to all users. The customers can use the MakeMyTrip website or mobile app to book flights, international hotels, buses, holiday vacations, cabs, homestays, gift cards etc. If you book flight tickets closer to your departure date, the prices will be sky high. It holds good for booking accommodations for holidays as well. Ideally, if you book 30 days before your due date, you can expect much lower prices. If possible, try to book tickets during the non-holiday season as the prices are ramped up during the festive period. Don’t forget to apply appropriate vouchers or activate deals before you check out. Lots of airlines provide great cashback offers on flight bookings these days. Signup for the newsletters or subscribe to frequent flyer programs to get exclusive redeemable reward points. Booking a round-trip ticket will generally cost you much lesser than a one-way one. It is common knowledge that non-refundable are far cheaper than refundable ones. Just make sure you are particular about your departure date. Opt for late night flights instead of morning and evening slots to save more on airline fare. You could opt for flying with non-luxury airlines which are cost effective. MakeMyTrip wallet enables you to make quick bookings without using your credit or debit card. This wallet will house the refund amount from canceled trips, MyCash earned through MMTBlack milestones. MyCash or the amount received through cancelations doesn't have an expiry date, but the amount earned through MMTBlack milestones will expire after three months. If you are using an MMT-ICICI co-branded card, then the amount accumulated will expire in 12 months. How To Use Makemytrip Wallet Bonus? MakeMyTrip wallet bonus or the reward bonus provided by MakeMyTrip as a promotional offer can be used to make bookings for flights, buses, hotels and holidays packages. There are specific criteria for using the MMT wallet bonus amount while booking flights, hotels and holidays. For domestic flights, Rs 500 (at least 2% of the booking amount), Rs. 1250 (at least 5% of the booking amount), for domestic hotels the applicable amount is Rs 4000 (at least 7% of the total booking). The other criteria for wallet bonus include Rs. 2000 for Flights+Hotels (at least 2% of the booking amount), Rs 2000 for online holiday booking (at least 2% of the booking amount). The amount applicable for bus and cabs booking is Rs 40 (at least 10% of the total reservation) and Rs 150 (at least 7.5% of the total booking amount). You can opt to use the MakeMyTrip wallet bonus while you're on the checkout page of making the booking. How Do I Book A Flight On MakeMyTrip? Booking a domestic flight is easy on MakeMyTrip. All you need to do is punch in the departure and the arrival destination cities, post which you have to choose the number of passengers traveling (adults and or kids), the class you will be availing (economy, premium economy or business) along with the departure and return dates (in case of a round trip). Click on the search button, and the best results will be displayed. You can choose the flights according to the price and the suitable timing after which you can proceed to payment and check out. Booking an international flight is similar to booking a domestic flight. You have to choose the departure and arrival destinations as well as the departure (one-way flights) and return date (for round trips). Then you have to enter the number of passengers traveling and the class (economy, economy premium, business, and first class), following which you can click on the search button. After choosing a flight from the displayed list, you can go ahead and book the trip by filling in the necessary fields which in most case are just the passport credentials and the VISA details. What Is The MakeMyTrip Flight Cancellation & Refund Policy? If you want a refund on a canceled booking, then you need to inform MakeMyTrip. Log in here and mention about the said cancellation under the special claims section. In case you have a ticket, which isn’t utilized or you’ve experienced a flight not operational situation, submit the request under the special claims section. MakeMyTrip will initiate the refund to the user’s account. However, the online travel booking company might charge Rs 250 as a cancellation fee. How Can I Pay For My Flight Or Hotel Booking At MakeMyTrip? Gurugram based OTA, MakeMyTrip has reported the results of Q3 of FY 2018-19 and the adjusted revenue has seen a 31.4% Year-on-Year growth reaching $179.9 million. The fiscal quarter ending on December 30th, 2018 has also witnessed gross bookings going up to $1.4 billion from 1.2 billion in quarter 2 of FY 2018-19 while the company stocks went up by 11% post the financial announcement. How Can I Connect To MakeMyTrip On Social Media? 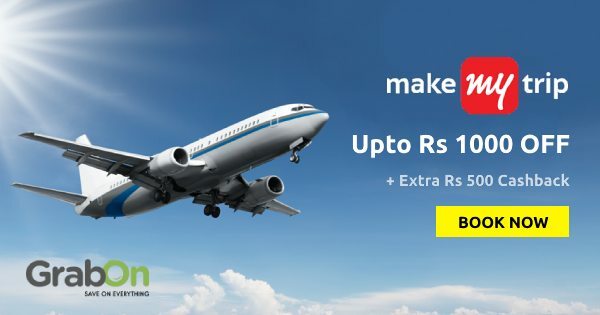 How To Use MakeMyTrip Discount Codes? Visit GrabOn.in and type in MakeMyTrip in the search bar. There was never a better time to make savings on your travel than now. Book a domestic and international flights, trains & bus tickets or book hotels online. There are a good number of travel packages and best deals every day. Experience the diversified scenic beauty, go camping, plan vacation, go for a weekend getaway with special Make My Trip offers. We aim to bring you the best last-minute flight and hotel discounts. Get access to best bank offers with ICICI, HDFC, Axis Bank, and SBI credit, debit card and net banking. Select the coupon code that gives you maximum discount or cashback and save on your illustrious short or long holiday.